A Reiki lineage is the line of Reiki Masters who have passed Reiki along to an individual by attunement. In the West all Reiki lineages flow through the same three Masters - Mikao Usui, Chujiro Hayashi and Hawayo Takata. Mrs. Takata taught 22 people to be Reiki Masters, and from each one of them comes the lineages of Western Reiki. Each lineage of Reiki differs in the way Reiki is taught because each Master has experienced Reiki in a slightly different way. However, no lineage is better or more important than another as the same type of energy is being worked with. 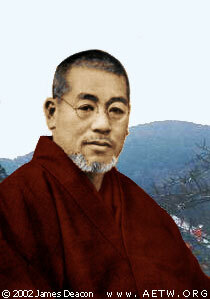 Here's a photo of the originator of Reiki, Mikao Usui. Many thanks to James Deacon for kind use of the artwork.